Reading this week’s issue of Showcasing the DNR and its feature on the wildlife restoration success story represented by the Kirtland’s warbler once again brought to mind the importance of conservation education. It was a just over two years ago when controversy erupted as a result of the disclosure that Deer Range Improvement Project funds (DRIP) had been used as a match for an otherwise federally-funded Kirtland’s warbler habitat restoration project. In today’s world of quick sound bites and short attention spans, this appeared, on the surface, to be an egregious misuse of sportsmen’s dollars. Although the decision to suspend the use of DRIP funds as a match was probably a reasonable one, the original concept of leveraging federal dollars in this manner for the benefit of multiple wildlife species, especially deer, was nothing for which an apology was necessary. To those of us who have spent time in these high-density jack pine plantings which are created to replicate a natural post-fire condition, we have seen that this habitat serves to benefit far more than just a small endangered warbler. In the plains of north-central Michigan as well as portions of the eastern U.P. where excessively-drained, sandy soils will support little else in the way of alternative timber, these high-density jack pine stands are the preferred home to both game and non-game species. After all, both the pine and the wildlife have co-evolved for centuries in this area for millennia. In addition to white-tailed deer and the occasional bear, these stands are also attractive to winter predator hunters and bunny hunters, both as a result of the presence of snowshoe hare. Don’t take our word for it, just try and get a good beagle out of one of these stands! Not only is this a great restoration story, but those of us in the outdoor community should take pride any time that habitat improvement efforts of this type have far-reaching benefit. After all, it is worth recalling that 75 years ago when the Pittman-Robertson Wildlife Restoration Act was voted into law it was intended to benefit both game and non-game wildlife species. There is no better way to demonstrate to the non-hunting public how sportsmen are the original 20th century conservationists and the biggest financial contributors to all forms of wildlife habitat restoration. Listening to birds singing in the forest just after dawn on a late spring day in northern Michigan. It might sound like a relaxing morning stroll, but for some members of the Department of Natural Resources’ Wildlife Division staff, it’s part of an important effort to conserve a rare and endangered bird species. 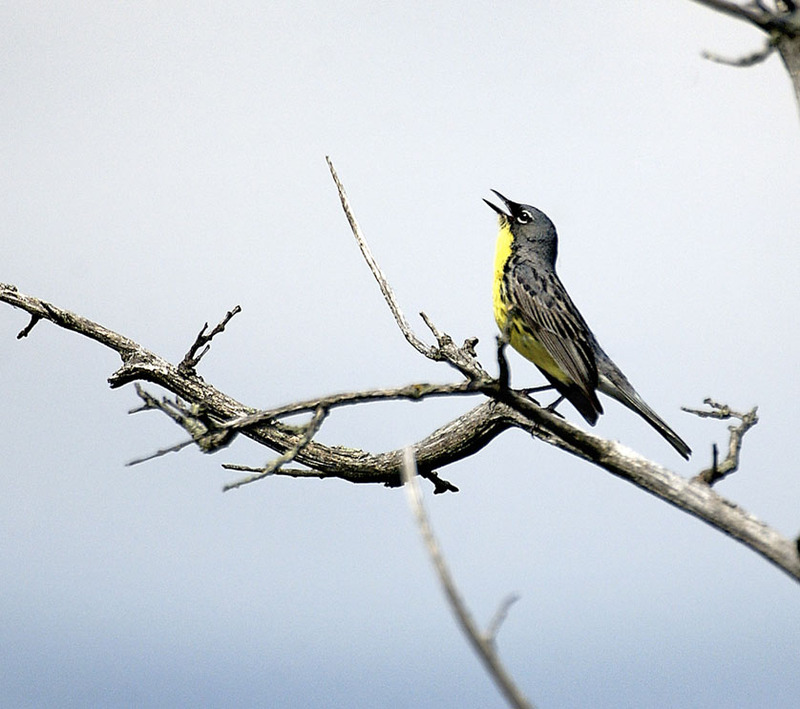 “As part of a recovery plan aimed at increasing the Kirtland’s warbler population, the Wildlife Division coordinates a monitoring program that includes counting singing males during a two-week period in June. Keeping tabs on the breeding population helps the Kirtland’s Warbler Recovery Team – a cooperative venture of the DNR, U.S. Forest Service, U.S. Fish & Wildlife Service, Michigan Department of Military and Veterans Affairs, and various other private citizens and organizations – evaluate how the species is responding to management practices and environmental changes. What’s so special about this little songbird? “The Kirtland’s warbler is one of 13 federally endangered species that occur in Michigan and one of two endangered bird species,” said Keith Kintigh, the DNR’s northern Lower Peninsula wildlife supervisor. “With a population of about 4,000, it is among the rarest birds in North America, sharing this list with such species as the California condor and the whooping crane.” The birds nest in just a few counties in Michigan’s northern Lower and Upper peninsulas, a few sites in Wisconsin and Ontario, and nowhere else on Earth. “Nearly 30 percent of the population is in one township, and over 75 percent of the population is in portions of only three counties,” Kintigh said. The unique bird brings in tourism and helps boost local economies, with birdwatchers from around the world flocking to northern Michigan in the spring and summer for Kirtland’s warbler viewing tours. Michigan’s first known Kirtland’s warbler nest was spotted in Oscoda County in 1903 and, until 1996, all nests were found within 60 miles of this site. Since then, a small number of nests have been found each year in the Upper Peninsula, and nesting also has occurred in Wisconsin and the province of Ontario. One of more than 200 neo-tropical migratory species that nest in North America and winter in the tropics, Kirtland’s warblers spend eight months of the year in the Bahamas. Male Kirtland’s warblers arrive back in Michigan between May 3 and May 20, a few days ahead of the females. The males establish and defend territories and then court the females when they arrive. Males defend their territories with loud and persistent singing. First conducted in 1951 and carried out annually since 1971, the Kirtland’s warbler census is a count of singing males. Preliminary analysis of the 2012 census data shows that Kirtland’s warbler populations are increasing. The DNR will release details about these findings within the next few weeks. Another key aspect of the Kirtland’s Warbler Recovery Plan is the development and maintenance of suitable nesting habitat on a sustained basis. The birds nest only in young jack pine forests with a special type of sandy soil known as Grayling sand. They prefer jack pine stands over 200 acres in size with numerous small openings. They nest on the ground under the living branches of the small trees that are five to 20 years old. When the trees reach about 20 years old, Kirtland’s warbler leave the area to other bird species such as Nashville warbler and hermit thrush. The young jack pine (that the Kirtland’s warbler depends on) grow after fire removes older trees and rejuvenates the forest. Heat from fire opens jack pine cones to release seeds and prepares the ground for the germination of the seeds. In the past, naturally occurring wildfires that swept through the region helped maintain the jack pine barrens, but the advent of modern fire protection and suppression efforts led to a drastic decline of available Kirtland’s warbler nesting habitat, and the bird’s population plummeted. To protect the species from extinction and increase its population, special areas were set aside and designated to provide appropriate habitat for the Kirtland’s warbler. The DNR and its partners manage jack pine habitat by logging, burning, seeding and replanting on a rotational basis to provide approximately 38,000 acres of productive nesting habitat at all times. Several million seedlings are planted each year. 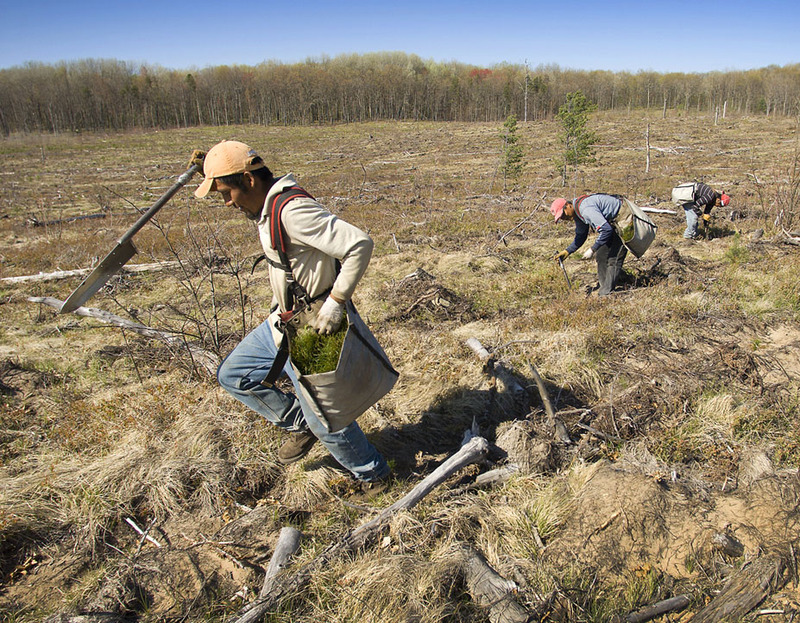 “By managing jack pine stands on a 50-year harvest rotation – which means trees aren’t cut down until they’re mature and large enough to be economically valuable – we can maintain nesting habitat for the warblers while supporting the commercial harvest of jack pine,” Kintigh said. These management efforts also provide key habitats for other animals, including other rare species like upland sandpipers and prairie warblers, as well as game species like white-tailed deer, black bear, ruffed grouse and snowshoe hare. Several protected prairie plants, such as the Allegheny plum, Hill’s thistle and rough fescue, also make their home in the same jack pine forests as Kirtland’s warblers. All of these species – and the hunting and wildlife-watching recreation opportunities they offer – benefit from the ongoing work to provide young jack pine habitat. Counts from the annual Kirtland’s warbler census have shown a significant increase in the species’ population over the last 40 years – from approximately 200 singing males in 1972 to 1,800 last year. Learn more about helping the Kirtland’s warbler and Michigan’s other threatened, endangered and nongame species at http://www.michigan.gov/nongamewildlife.